When walking through the doors of a restaurant, patrons expect their hosts to provide a clean, attractive environment and food that is safe to eat. While that may seem obvious, it wouldn’t necessarily be the case without some kind of oversight. Among the many responsibilities of local government is to aid in safeguarding the public’s health. 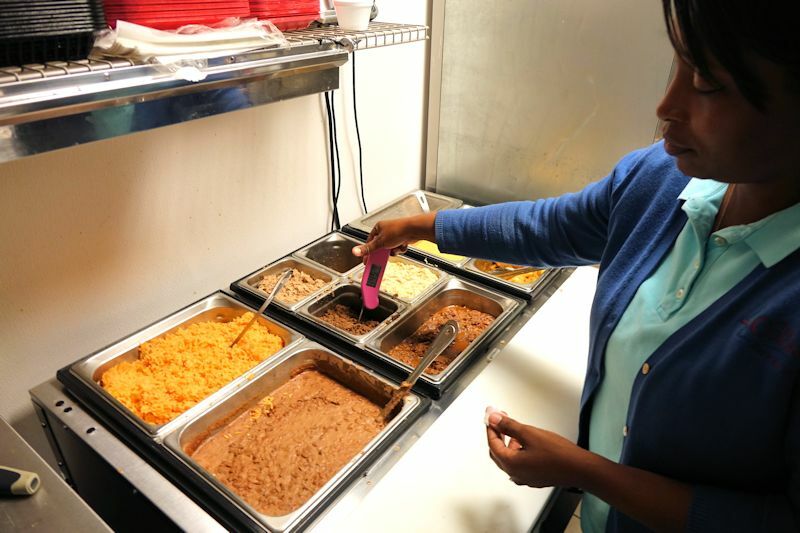 In The Colony, Health Inspector Mary Branch enforces the Minimum State standards and the city’s food safety ordinances by conducting periodic inspections at the city’s restaurants, school cafeterias, and daycare facilities that offer food services. Branch has 15 years of experience in health inspections, the last nine in The Colony. She started her career in Memphis. 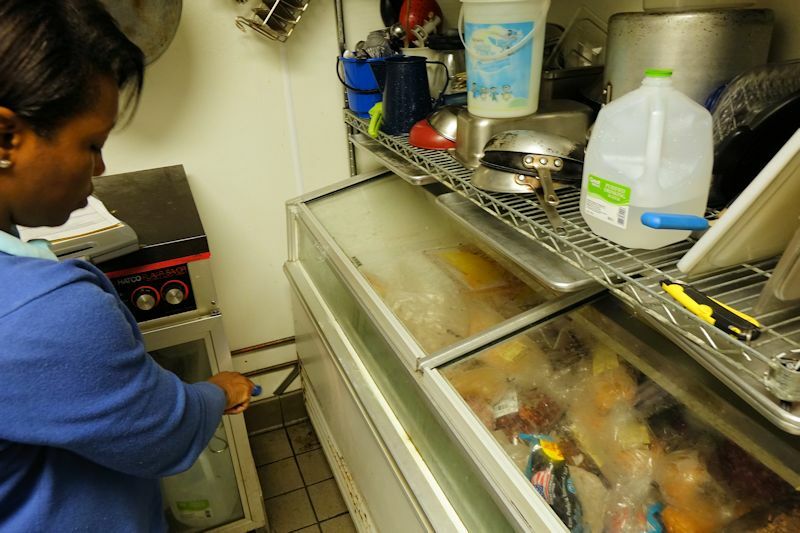 Cities each have their own ordinances but the majority of the rules and regulations she enforces are universal in terms of food temperatures and standard hygiene, Branch said. 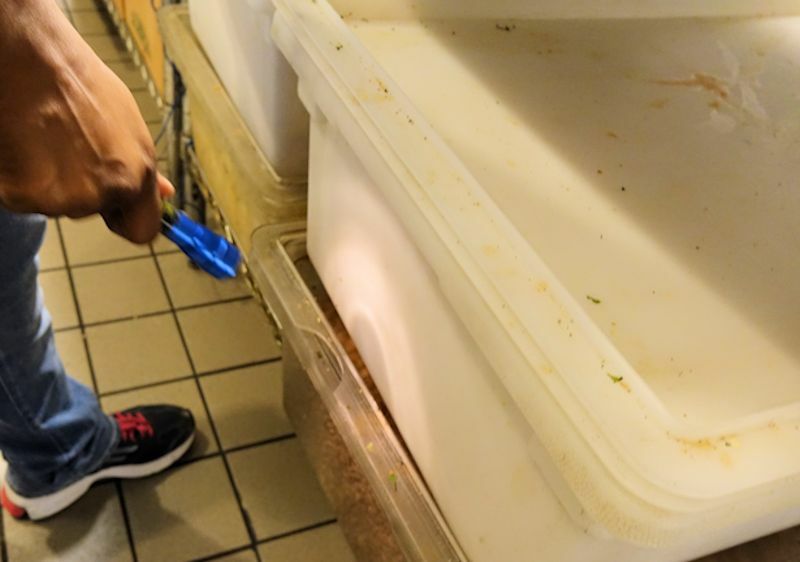 Health Inspector Mary Branch examines the cold storage area of a restaurant, looking for signs of pest activity. Every restaurant receives three annual inspections. All are unannounced unless it’s a brand new establishment or there’s been a change of ownership. With new owners, Branch schedules meetings so she can introduce herself and go over the city’s health inspection process as well as advise them about the pitfalls associated with potential upgrades or remodeling. Branch, however, does have a very thoughtful and deliberate routine she follows when conducting an inspection. The first step is looking to make sure the previous inspection score placard is prominently displayed as required. Health inspectors work off this checklist, which provides a comprehensive overview of all food-handling and hygiene practices, and note violations. The restaurant is provided a copy for future reference. As she notices violations, she’ll stop and write them down, as well as point them out to the owner or manager of the restaurant. “Whatever the violation may be, we prefer it to be corrected while I’m here if at all possible,” she said. 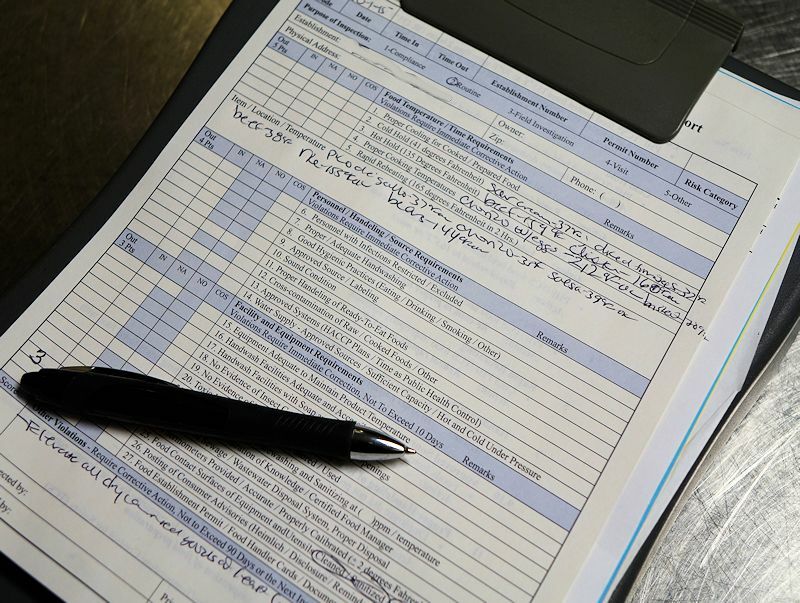 Some violations may seem minor compared to others, but the checklist provides a comprehensive overview of all food-handling and hygiene practices and observed records relating to food safety. Each violation counts against the final score and, ultimately, the letter grade on the placard. Food canisters, for example, need to be on a shelf, not on the floor. Shelving, in turn, gets sticky from built-up food debris and the cooking atmosphere in the kitchen, and must be cleaned. Branch inspects all the food-contact surfaces to make sure they are also clean. She checks out the cooking utensils to make sure they are in good repair and that the right utensils are being used by the food handlers, who must also be using gloves if they’re directly handling food. A cracked lid on this storage bin represents a hazard because broken pieces of plastic may get into the food. On a recent inspection, the lid to a plastic storage bin was cracked, costing points. “That could pose a threat because fragments of that bin could get into the food,” she said. Health Inspector Mary Branch checks the temperature of food kept in a hot-holding table. It should be at least 135 degrees. Stored, precooked food must be kept at a minimum temperature as well. If a tested cold item is within 10 degrees, it can be moved to a colder storage unit instead of being tossed out. Even if a food item has been recently removed from storage then put back, it’ll still result in lost points if it’s out of the correct temperature range. Another major component of the hygiene score is having hand-washing stations in each area of the kitchen, including the dishwashing area. And, if a station lacks soap, sanitizer, or paper towels, that’s more points lost. Branch inspects shipments of food products to make sure the food is properly packaged, not compromised by pests or temperature, and that it’s a product from an approved source. In the dishwashing area, she tests the PH levels water to ensure the proper amount of sanitizer is present in the cleaning solutions. Dishwashing areas have three compartments, where cookware and dishes are washed with detergent, rinsed, sanitized and then air-dried. Health Inspector Mary Branch tests the PH levels in the sanitizing solution of the dishwashing station. Pests, such as roaches, gnats, fruit flies, rats, and mice, can be a problem anywhere but particularly in the dishwashing area. “If the restaurant has a good system and follows the rules, we won’t find any pests,” Branch said. One of her last stops in the routine is to check the restrooms. They should be sanitary, and have soap, paper towels or a hand blower, trash receptacles, working plumbing, hot and cold running water, hand-washing signage for employees, and a self-closing door. At this time, she also requests proof of monthly pest-control treatments; proof of proper grease-trap disposal; and proof that a registered food manager is on site at all times. She also requests food handler cards for all employees working in the kitchen. “These documents should always be on the premises, in a binder system or folder. If not, those are technicalities that will cost more points. It’s an important part of the process,” Branch said. Food canisters must be stored on a shelf, not on the floor. By its nature, food preparation is a messy business. It’s difficult for a restaurant to receive a perfect score. “Some of it is expected, it’s the nature of the business,” Branch said. “But we like to see that they can improve, and that whatever violations we find, they’re willing to come in compliance as soon as possible.” Failure to comply within the specified time frame may result in citations or closure of the establishment. In one recent inspection, the restaurant’s grade went from an A to a B, with a score of 86. 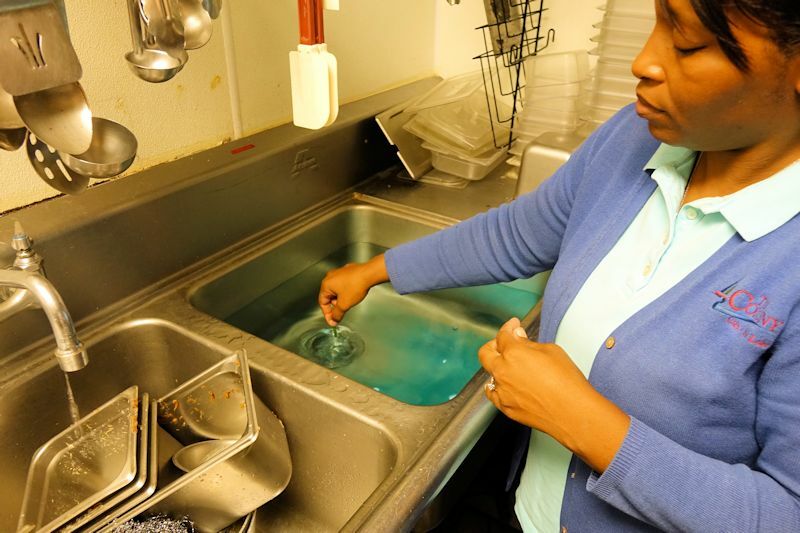 Noteworthy violations included dirty shelving, lack of required documentation, one food item out of temperature, and an inoperable soap dispenser in the dishwashing area. No pests, no extreme temperature or food-handling violations – and still a B. Branch said some restaurant owners complain about being required to post the scorecards in the establishment because they feel it has a direct impact on their business. 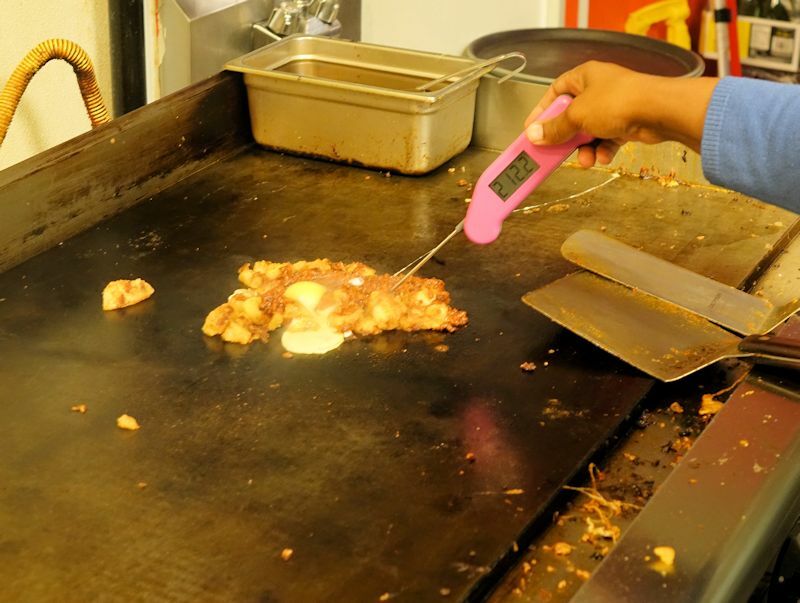 Food temperatures are a key component of the health inspection process. Depending on the type of food, minimum safe cooking temperatures range from 145 to 165 degrees. Cooks may choose to cook food to higher temperatures of about 200 degrees. Use of the health inspection placards has the support of the City Council. During discussion at a regular meeting in August, Mayor Joe McCourry said the system promotes transparency and encourages restaurants to get the highest score possible. Branch added that food safety and education are paramount components of the program, and stressed her focus is on reducing the occurrences of foodborne practices within the community. “I advise consumers to review the entire inspection history of an establishment, not just the individual inspection score. That will provide a more accurate picture of an establishment’s commitment to food safety and sanitation,” she said. With the ever-increasing number of restaurants in the city, the 2015-16 fiscal year budget includes adding a new position to help with health inspections. 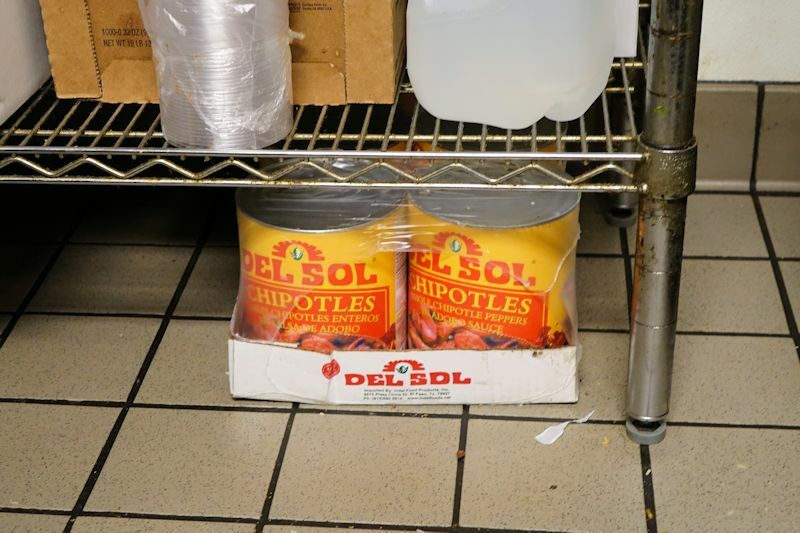 Not only can two cover more ground than one, but restaurants will have the benefit of more timely re-inspections when requested or to follow-up that violations have been corrected. Most restaurants, however, are cooperative and understanding. “If you’re clean and want to serve safe food, you have nothing to hide,” Branch said.